Updated Wednesday July 6, 2016 by Alexandre Silberman. It is exciting to announce that the much anticipated documentary Journey to Cuba: Eleven Young Players Make History On the Diamond is now available! The film, which features four BA players, as well as longtime coach and volunteer Tom Simon, documents the story of a group of eleven Vermonters who became the first youth baseball team to travel to Cuba since the embargo in the 1960s. The team's diplomatic voyage took place this past April. The documentary was produced by BA alumnus and Burlington High School student Alexandre Silberman. Journey to Cuba premiered on June 16 at Burlington City Hall and was very well received by an excellent crowd of around 200 people. You can now watch the film online for free! The duration is 1 hour and 15 minutes. Check it out below, or use this link. Learn more about the trip by visiting the team's blog. 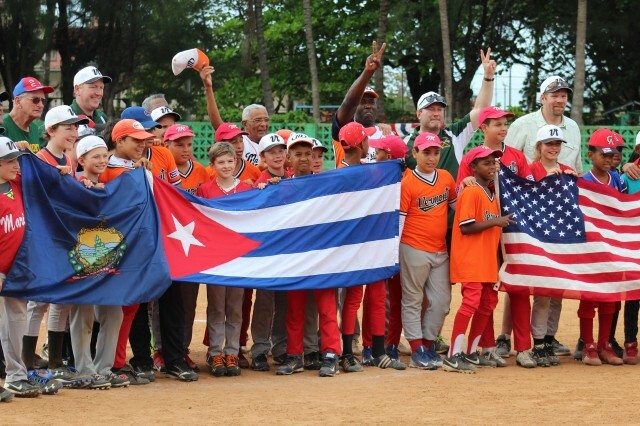 Journey to Cuba: Eleven Young Players Make History On the Diamond from Alexandre Silberman on Vimeo.